The Big Apple. Gotham. Empire City. Or just New York. It’s the world’s most populous city and it’s been dubbed creative capital of the world. It’s the birthplace of disco and punk rock. It brought us Robert de Niro, Howard Stern and Mike Tyson, and according to Startup Genome, it has a talent-rich ecosystem. 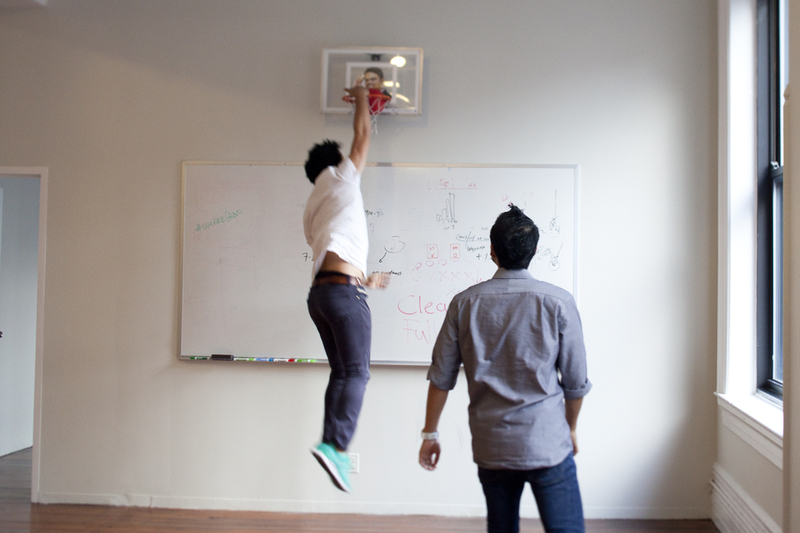 So we cordially invite you for a look inside some of the coolest NYC tech and startup offices. And while you’re at it, don’t forget to check out the Berlin startup scene, Europe’s tech-hub Dublin and 13 of Amsterdam’s finest! Founded by college friends Ben Lerer and Adam Rich, Thrillist is a men’s digital lifestyle publication. Brought down to its essence, the Thrillist team recommends cool new stuff to its mainly young, urban and male target audience. And this can be anything: the city’s best food, drinks, gear, services, entertainment, travel options or events. In other words: from BBQ rattlesnake salads to stripper cruise trips. In 2010, Thrillist acquired Jackthreads, a men’s members-only shopping club, to form the Thrillist Media Group. The company resides in SoHo, a Manhattan area well-known to seekers of fashionable clothing and exquisite architecture. But SoHo today is also an epicenter for tech startups such as Foursquare, ZocDoc and 10gen. 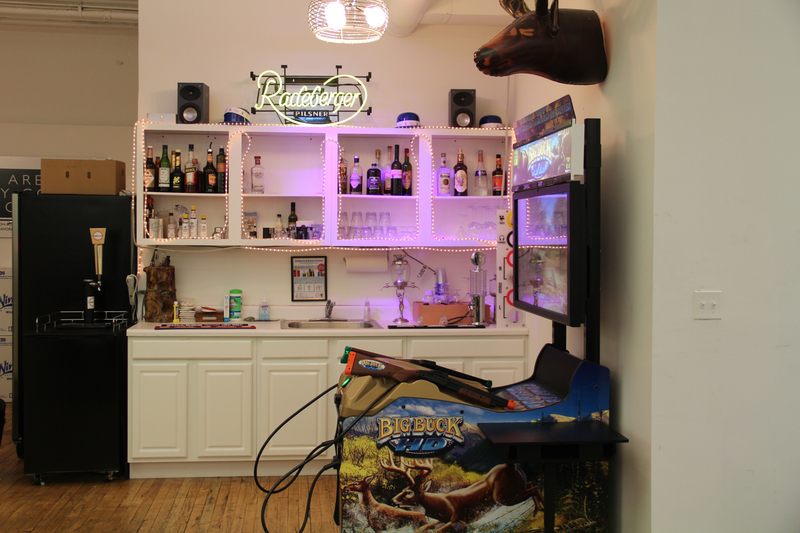 The Thrillist team often hosts happy hours and tastings at the office. And once a year, team members from the rest of the country are flown in for a company picnic with Thrillist trivia (also known as ‘Thrivia’), and to participate in the Thrillist Cup, which according to Devon Giddon, the company’s director of communications, is “sort of like a beer Olympics”. Content comes before people’s eyes faster and faster, and it ends up at the bottom of their streams faster and faster. A lot of marketeers respond by pushing masses of content to generate as many eyeballs as possible, but that hardly makes things interesting for your target group. Percolate’s software helps big brands create a large scale of relevant, quality content and to share it through social media. Staying healthy in an office can be difficult at times, so this team has its very own vegetable strategist, does weekly push-up sessions (Remind you of anyone? Look at the last company in this article!) and takes bike rides to Montauk. 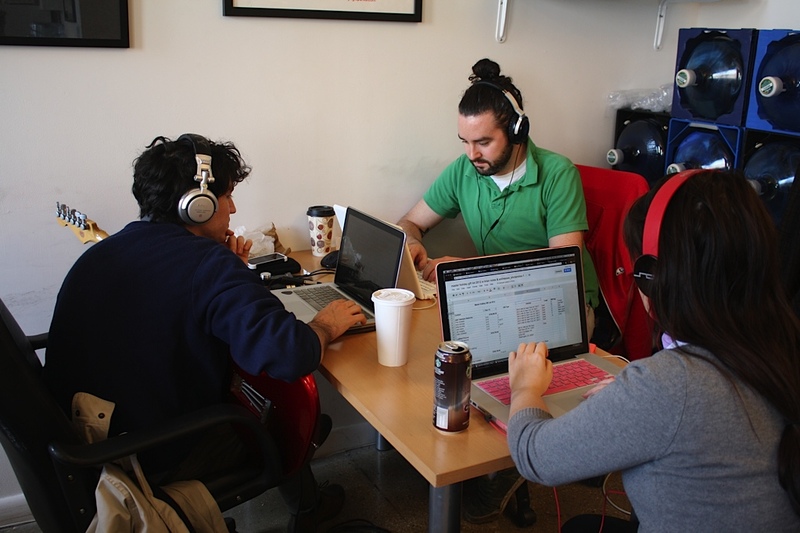 But there’s more than diet and sports here: Percolate organizes Hack Days and even has its own soundtrack! Need a jingle for your film, advertisement, game or whatever? Launched in the summer of 2008, Jingle Punks wanted to fill a void left by stock libraries who refused to deliver relevant and hip music content. So these Punks created a private social network to connect indie musicians with multimedia, television, film and advertising agencies. And they maintain a library that algorithmically tags independent music so producers can easily find the songs they’re looking for. The Jingle Punks also compose music for producers who can’t find what they need in the company’s library. So this workplace is part office, part music studio. Hence, the space is filled with musicians and their instruments. And so is the wall, an ode to Jingle Punks’ favourite legends, created by of the company’s artist community. Frustration: sometimes it’s the best mother of innovation. Ryan Frankel and Kunal Sarda have had their share of language barrier problems: Frankel found himself sick in China, unable to buy the right medication; Sarda was robbed in Paris and ended up stuck in the wrong part of town. So they created VerbalizeIt: instant phone and web-based access to human translators to facilitate global conversations. They’re now eight team members strong, a close-knit group that spends a lot of time together after working hours, also when it comes to each other’s weddings. They share their office with several other companies, so they’ve got access to several conference rooms for private meetings and group discussions, and a pretty large lobby with plenty of refreshments. Based behind the birthplace of former US president Theodore Roosevelt, and very close to Union Square, the office has an amazing view of the Empire State Building. And with wide open spaces, it’s not half bad inside either. Especially when you count in basketball nets over white boards. You could argue otherwise of course, but we think online dating’s one of the things Internet was meant for because why shouldn’t we be able to discover true love online when we can find pretty much everything else there? But HowAboutWe takes it a step further: it allows singles to connect by letting them come up with fun date ideas. And it helps couples enrich their relationships by offering them a curated collection of great date experiences, built for two. The team operates from Brooklyn’s DUMBO (Down Under the Manhattan Bridge Overpass), in a former warehouse of the Grand Union Tea Company. And since their work is all about doing something fun together, they also do paintball outings, Thanksgiving dinners at the office and cruises on the Hudson River. Always wanted cool art on your walls, but lack the money to get it? Artsicle allows users to rent instead of buy art. This gives art lovers and collectors cheap access to all sorts of new art, but it also helps artists make a living. Artsicle has its office on the fifteenth floor of a building around the corner from the Gershwin Hotel (a tribute to late pop artist Andy Warhol). With eight foot tall windows overlooking the west side of Manhattan, people here don’t mind working until sunset. And because they spend a lot of time here, they’ve tried to make it look like home. Everything at the office is personalized or personalizable: the outside of the fridge is a blackboard for example. There’s a trampoline where non-artists might expect a coffee table. And, of course, the walls here are covered with art. The publishing industry’s undergoing major changes, forcing many journalists and storytellers to go freelance. Contently created a platform that connects these creative minds to publishers. The company has its office right at the intersection of Broadway and Houston, and shares its space with two other startups, Wakefield and Adcade. The themed rooms are a nice touch: there’s a grizzly room, a robot room and a dinosaur space, to name three. And instead of white boards or flip-overs, all have writable walls and surfaces. Web designers Danny Wen and Shawn Liu were looking for a tool to easily keep track of billable time and invoices. They couldn’t find one, so decided to create Harvest back in 2006. They’ve grown it into a proper company that now serves time-tracking and billing needs to thousands of clients around the world. And they do all of it behind height-adjustable Geek Desks. On Wednesdays they order vast quantities of food for family-styled lunches. And on nights out, the Harvest guys and girls can be spotted in karaoke bars. Coffee is Harvest’s black gold, even for remote team members, who all receive their very own Craft Coffee subscription. Ever felt like you needed an extra set of hands? Fancy Hands, ehm, hands them to you with its service. For a monthly membership fee users can call in or email their requests, which are then carried out by Fancy Hands’ thousands of assistants who work across the US. Again, an idea born out of personal frustration: Ted Roden founded the company when his life proved too busy to handle on his own. Fittingly, hands are also the defining office interior theme. You can literally find them everywhere in the office. And this is no outside job: the company’s Art Director David Trawin painted the walls, refinished the furniture, chose the artwork, and adorned the power outlets with wacky characters like Hulk Hogan. For online retailers with a hard time converting, Intent Media seeks to revolutionize e-commerce, letting them offer smart and relevant advertising while protecting core transaction revenue. The company’s office is based in what used to be known as Manhattan’s ‘Printing District’, close to one of New York’s oldest bars and the Holland Tunnel (once the longest underwater tunnel in the world). Befitting a tech company, Intent often organizes hack days. But these ones aren’t just for the geek department: they’re for everyone in the team. And Intent hosts ‘tech talks’ at the office, inviting the NYC tech community for presentations and discussions on topics such as big data, testing, etc. Sunset Park headquarters in Brooklyn was a weapons production facility during World War II. Today it houses creative companies. One of those is DateMySchool, the US’ largest dating platform for students and alumni. It sets itself apart from other dating sites through safety and exclusivity (it’s only available to verified students and alumni) and anonymity: members can restrict schools, departments and individuals from accessing their profiles, making for worry-free online dating. Work is activity number one in this office, but there’s a special bond between team members. The co-founders live with several of their colleagues, and subway rides home often double as brainstorm and strategy sessions. And they’ve introduced us to the first startup mobile home. A pink one. For cruising across the city. Now that’s billboard advertising! One of the bigger tech companies in the New York scene, AppNexus built an open and customizable advertising technology platform. Standing outside on 23rd, between 5th and 6th, you wouldn’t say you’re looking at a tech office. We’d sooner say ‘ancient Roman temple’. But step inside and you’ll find a sleek interior, designed to match the company’s colours. AppNexus has outgrown the startup phase and so goes full monty with coffee: you can take your pick from multiple coffee machines and even differently flavoured syrups. Proceed to the lounge area and you’ll be able to get an overview of the company’s history: the writing’s on the walls. Art.sy really fits New York’s spirit as cultural capital of the world. The company created a search engine that allows users to find art by style, category, size, colour, etc, and it gives users personalized recommendations to make discovering art less intimidating. Artsy won the 2010 ‘Rookie Disruptor Award’, and fittingly disrupted the office space they subsequently moved into, tearing down cubicle dividers and walls to create one big open space. This New York-based startup offers classes and mingling space to tech developers, designers, and entrepreneurs. 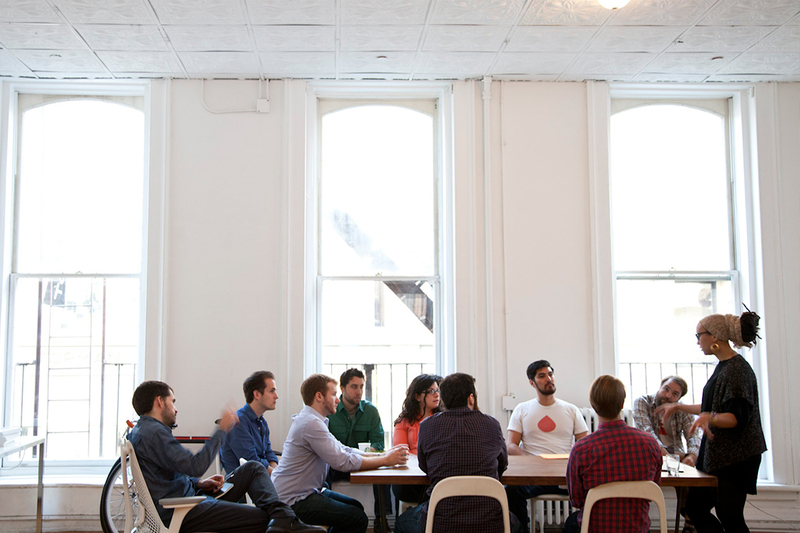 General Assembly’s office reflects many of the company’s values. For instance, all materials used in the space have warm yet neutral colours. To encourage play, people have a plethora of chalkboards and whiteboard walls at their disposal. Furniture is produced by small, emerging designers to support young entrepreneurs. A sustainable touch has been given to communal tables, they’re all made from reclaimed materials such as barn wood and old high school bleachers. And this was just part one! Stay tuned for another bite in the Big Apple. Which startups would you like to see featured? In New York or somewhere else? Feel free to leave your ideas in the comments! Thrillist Media Group by Thrillist; Percolate by Percolate; Jingle Punks by Jingle Punks; VerbalizeIt by VerbalizeIt; Grovo by Grovo; HowAboutWe by HowAboutWe; Artsicle by Artsicle; Contently by Contently; Harvest by Harvest; Fancy Hands by Daniel Goodman; YellowHammer Media Group by YellowHammer Media Group; Intent Media by MODO; DateMySchool by DateMySchool; Noom by Noom; AppNexus by AppNexus; Art.sy by Art.sy; General Assembly by Max Höll.